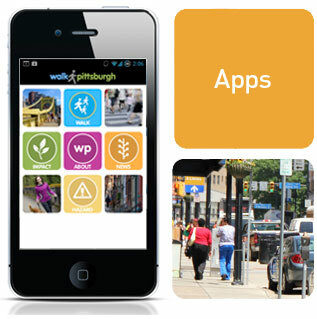 The WalkPittsburgh.org mobile application is an integral piece to the program. Available for iPhone and Android devices, the mobile app includes a pedometer that counts your steps for each walking session and stores your walking data into the WalkPittsburgh.org database. This allows the program to measure its success on both a neighborhood and regional scale! WalkPittsburgh.org will track your individual walking metrics, display the total statistics of the walkers in your neighborhood, show how your neighborhood statistics measure up against other Pittsburgh area neighborhoods and also display the overall results from all walkers in the program. We aim to reduce the city's carbon footprint, encourage individuals to stay healthy and promote safe walking as a commuting alternative in Allegheny County! FOR BEST ACCURACY, the pedometer should be worn on the waistband (via the pedometer belt clip). If the pedometer is loosely contained, the unit’s accuracy will be compromised. NOTE: At the onset of activity, the pedometer will only start counting steps after ‘10’ like steps have been taken. This feature exists to ensure that the pedometer is counting your steps not a random movement.